Periodontal disease is a term used to describe inflammation or infection of the tissues surrounding the tooth. Accumulation of tartar and calculus on the teeth contributes to gum recession around the base of the tooth. Infection soon follows and the gums recede, exposing sensitive unprotected tooth surfaces. The untreated infection then spreads into the tooth socket and ultimately the tooth loosens and is lost. What is tartar and can it be prevented? The mouth of all mammals is home to thousands of bacteria. Many of these bacteria will breed on the surfaces of the tooth and form an invisible layer called plaque or biofilm. 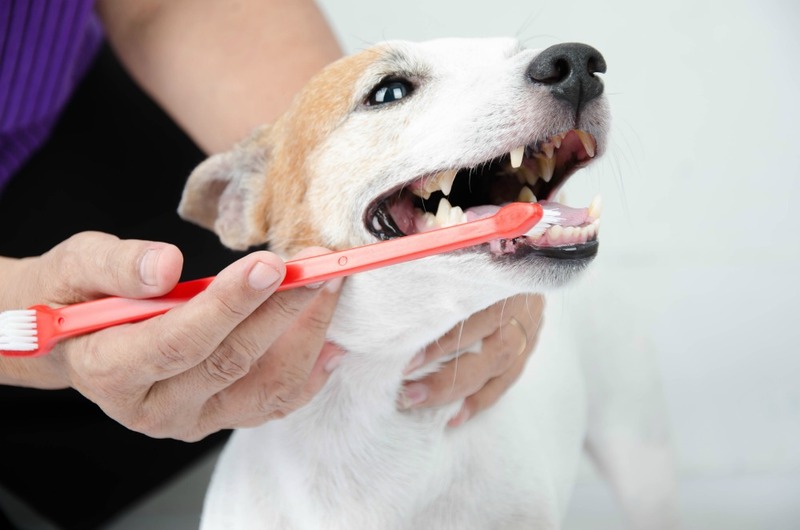 Some of this is removed naturally by the dog’s tongue and chewing habits but if allowed to remain on the tooth surface, the plaque thickens, becomes mineralized and is then visible as tartar and ultimately calculus. The tartar presses on the gums, which recede, causing inflammation and infection called gingivitis. The gums continue to recede until ultimately the tooth socket is infected and the tooth is lost. As the oral infection increases, tonsillitis and pharyngitis can also occur. In addition, the bacteria are absorbed into the bloodstream and can be carried to other organs. Heart valve infections (endocardiosis or endocarditis), kidney and liver problems are frequently caused by “bad teeth”. Plaque becomes mineralized in some dogs much quicker than in others. Special canine chew toys, as well as feeding specifically-formulated dental diets, may help reduce tartar build-up, as does regular home care such as tooth brushing. Today there are many products designed to reduce tartar in our dogs. If you have any questions or would like to book your pet for an appointment, please give us a call at 902.443.9385 and one of our friendly team members will be happy to assist!